So last year I wanted to go simple. I hate elaborate costumes and like to keep things simple, in fact the best costume I’ve ever seen was Seth Greens God name tag in Buffy the vampire slayer. Simple, easy, cheap and amusing. Alien & Aliens are in my top 20 films of all time (probably an idea for a post right there) so I looked to them for inspiration. One of the most remarkable scenes is when John Hurt’s laying on the table and the Alien emerges through his chest. 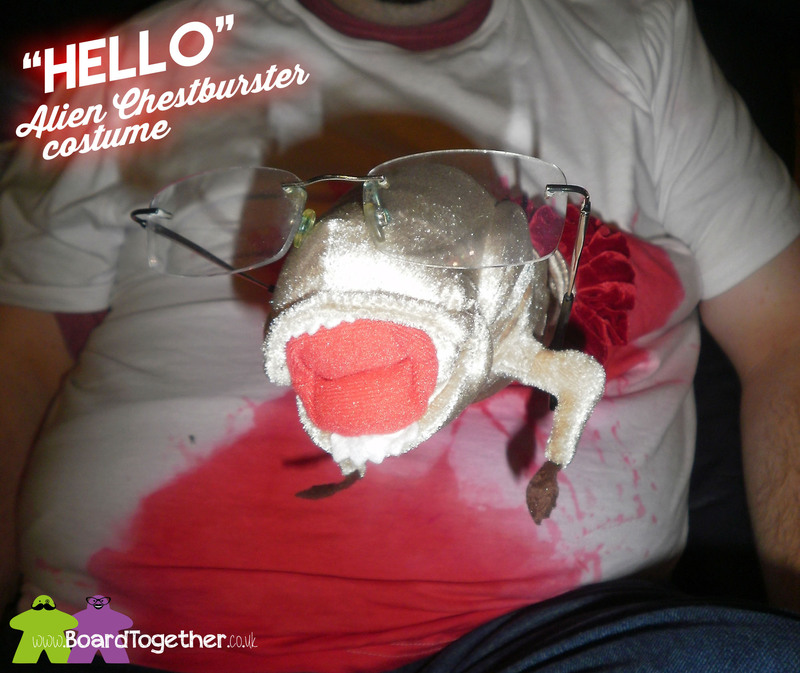 Now that’s a Halloween costume idea! 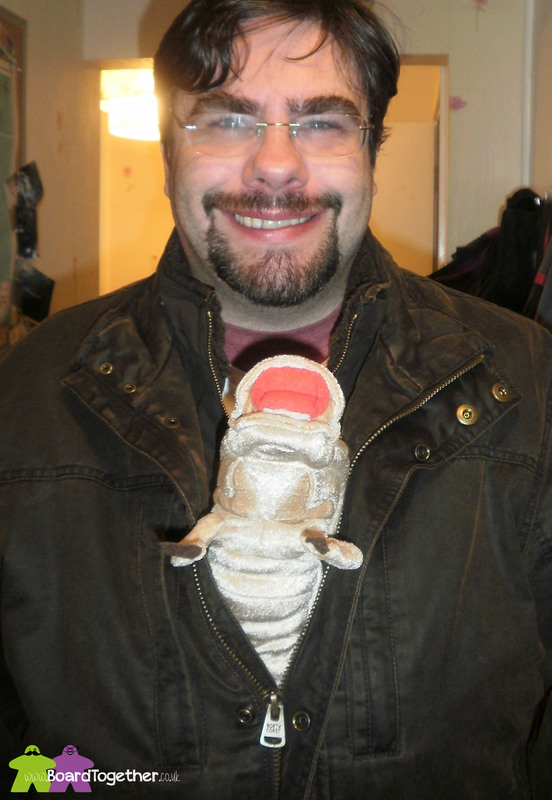 So I started the hunt on the internet and was able to purchase a plush Alien Chest Burster for about £20. He was scary and cute at the same time. It also had a long tail which was going to make it easy to hold it in place when it was under my shirt. While we waited for the Alien to turn up it was time to start on the shirt. The first part was to stain the front of the shirt red, well it should look like it had just ripped its way through my front so the wife went to it with the red dye. Once the dye had dried, I didn’t want it rubbing off on my new Alien friend, we cut a hole for the Alien to poke through and attached a red scrunchie hairband for that extra ‘blood & guts’ look. It worked great, the aliens tail wrapped its way around my middle and held the head at just the right angle to go through the hole we cut. I put a coat on to hide the Aliens tail that snaked its way around my back and adjusted the wire that runs the length of its body. I was very happy with the way it turned out. 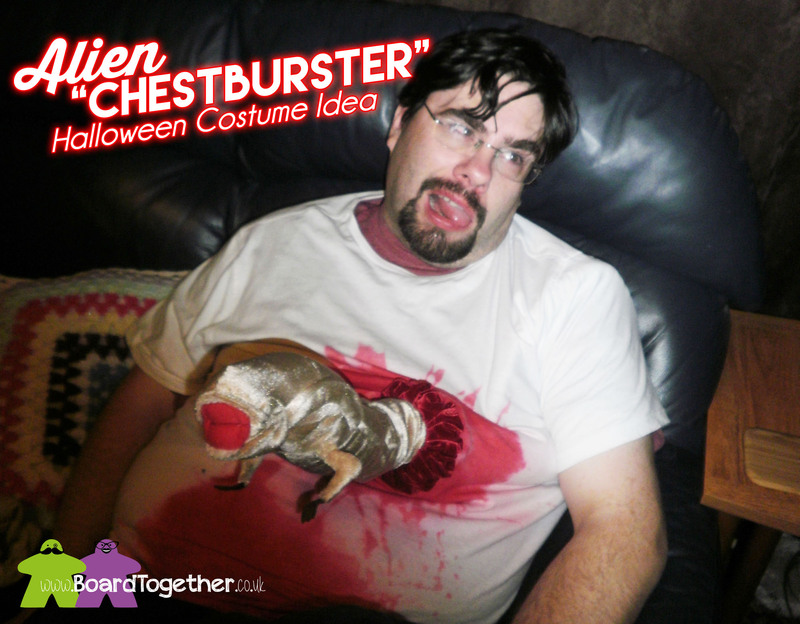 I’m sure that there are commercial Alien Chest-burster T-Shirts out there but I also wanted something that would last beyond Halloween. So now we have a plush fiendy friend that wraps his way around our TV. Then freaks out friends and family when they notice during the middle of something like Eastenders! Hello my baby, Hello my darlin, Hello my good time gal . . .